Washington teachers use student achievement data to drive instructional decision making. There are a lot of great things going on around the district. This week, a shout out to the Washington Elementary staff is in order for the great work they are doing looking deeply into student achievement data to guide instruction. Doing this allows them to more effectively meet students' specific academic needs. I also want to show my appreciation for the hard work our young men and women are doing in school activities around the district. With the arrival of the Labor Day weekend our activities are off and running. Our football, soccer, cross country, and volleyball teams are off to a great start; our softball team won this year’s bat game against a Florence squad that had no quit in them. 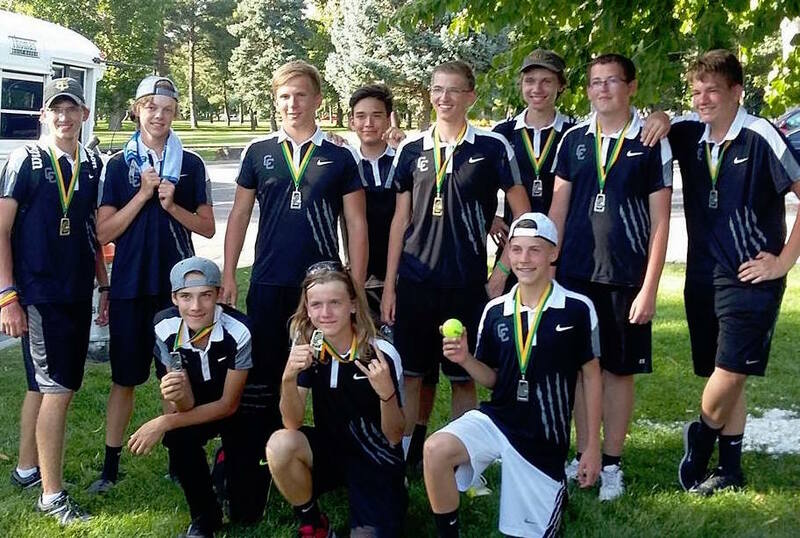 Our men’s tennis team won the overall championship at the Hornet Invitational in Pueblo over the weekend, and of course our marching band did not take the weekend off, with members participating in an 8 hour practice marathon on Saturday! Back in early August the district received notice it was being given USDA Food and Nutrition Services recognition in the Healthier US School Challenges: Smarter Lunchrooms awards program. Cañon City High School, CCMS, CES, Harrison K-8, Lincoln School of Science and Technology, McKinley Elementary, and Washington Elementary all received bronze recognition through this program for efforts related to improving health and wellness in an effort to impact student achievement. As a result, each of these schools will receive a plaque, a banner, and a cash award for their efforts. Thank you to our fine nutrition services staff, as well as our regional health and wellness committee for their efforts on this front. On Thursday the CCHS softball team win that annual bat game! The CCHS men's tennis team won the Hornet Invitational on Saturday! Lincoln teachers have been working together to identify which new literacy materials are best for teaching specific learning targets. 1. At the beginning of each lesson, the teacher will communicate an appropriately rigorous learning target, in kid friendly language, using the method: who will be able to do what, how. This target will be clearly aligned to our district curriculum map and relevant to the future of each student. 2. Teachers will continuously monitor their classes, making use of strategies that actively engage all students to achieve the daily learning target. 3. The teacher will use a variety of effective formative and summative assessments to measure learning and guide further instruction. As I have observed our instructional evaluators coaching teachers through classroom visits, I have noticed a particularly strong focus on foundation number 1, learning targets. As a result I already see tremendous improvement in the daily learning targets produced by our teachers, and have no doubt this will result in students with more clear understanding of what they are learning, why they are learning it, and what they must do to prove they have mastered each concept. Schools in our district have been working toward a fundamental instructional focus like this, but this is the first year we have all agreed upon what these priorities should be. I think the true value in this work will be allowing our instructional leaders to learn from each other about how best to coach and support our teaching staff as they apply our instructional foundations. On Monday morning I conducted in-school office hours at Lincoln School of Science and Technology. I also met with board president Larry Oddo, and attended a CES leadership team meeting in the afternoon. On Tuesday I traveled to Colorado Department of Education in Denver with CES principal Scott Morton, director of instruction Adam Hartman and district literacy coordinator Gina Gallegos to discuss how we can best implement our new Journeys reading resources at CES while remaining true to their exploratory and multi-grade instruction models. On Wednesday I conducted in-building office hours at CCMS and met with an interested community member about our health education efforts. On Thursday I had a monthly meeting with RE-2 superintendent Rhonda Roberts, met with folks at CCHS about how to better support high school student success on the SAT, spent time in the commons area at Harrison K-8 handling paperwork, attended an Evaluation Council meeting, then ended my day watching the last part of the CCHS Florence varsity softball game. On Friday I had some one-to-one meetings with district employees and spent a lot of time catching up on email and long term projects. Last year the PCC Fremont Campus organized a community wide 9-11 remembrance ceremony. We will hold this event again this year, on Friday September 9th at Citizen's Stadium beginning at 8:30 AM. I’ll be on Morning Line on the radio first thing Tuesday morning, then will attend SAC and leadership team meetings before heading over to watch the varsity volleyball match at the Tiger Dome. On Wednesday we have a central office staff meeting, and I’ll also hold monthly meetings with our operations staff, and director of special services Lynnette Stenihoff. Other things I’ll do on Tuesday include observing classroom instruction at Washington and aligning feedback with director of instruction Adam Hartman, planning our next building leader PLC session with literacy coordinator Gina Gallegos and Adam Hartman, and work on creating a literacy coach evaluation process with Gina Gallegos. I also hope to swing by 4 Mile Golf Club to watch some of the high school boys golf tournament on Wednesday afternoon. On Thursday I’ll attend an Early Childhood Leadership Commission meeting in Denver, and on Friday I’ll attend our community 9-11 event at Citizen’s Stadium. I also hope to end my day Friday at Citizen's stadium watching the varsity football team play its first home game of the season.